TCSJOHNHUXLEY, a leader in research, development, services and innovation in the live gaming space, will debut some exciting new additions to its portfolio at the forthcoming G2E Asia, to be held at The Venetian Macao from 21 to 23 May 2019. The company is set to debut its 8-player Qorex carousel unit at G2E Asia, a product designed to be “a real showstopper on the gaming floor.” Available for both 23” or 27” Qorex terminals and incorporating large scale 65” screens that can be seen right across the casino, the carousel units can be customized to include Asian influenced features such as ornate dragons or curved roof designs, all in a variety of colorways to match any interior. The carousel format is extremely flexible for operators and can be built around automated devices which include the Saturn Auto Roulette wheel, or the innovative Baccarat based-game of Gameball. In addition, players can choose from multiple games of live roulette and baccarat linked with live camera feeds from around the gaming floor, as well as RNG options. Also showcased will be a range of Blaze LED surface technology games. Blaze continues to be a popular choice with casinos across the globe, incorporating eye-catching patented game-attract animations as well as highlighting winning bets which excite new and experienced players whilst providing additional security to dealers and operations staff alike. 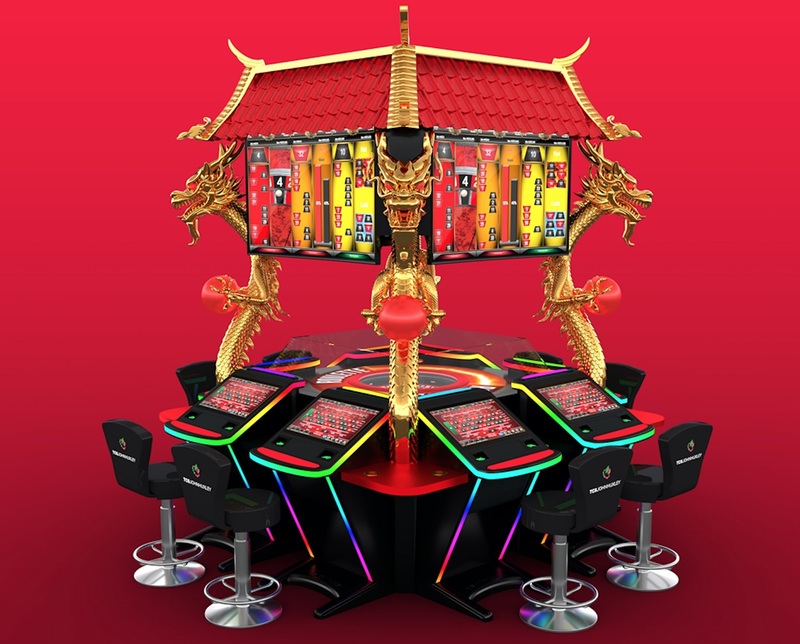 Joining the Blaze range and making its world-wide debut at G2E Asia 2019 is Blaze Baccarat which brings a new and exciting twist to the traditional game of Baccarat. The Ora winning number display range has been designed to offer a new dimension of game excitement and atmosphere on the casino gaming floor, helping to ensure the power of winning number displays is maximised. Launched at last year’s G2E Asia, the displays are joined by two new additions to the range which incorporate surveillance cameras and min/max displays. Available in landscape and portrait double sided options and various screen sizes, plus the ability to add eye-catching LED’s, there is now a display for every game type.